Hey y'all! It's a year to the day since I posted my first big hello to the blogship. Over 500 posts later and I've come to the conclusion that the Post-Cox and Forkum Era wasn't about apathy and regret. Quite the opposite! It's been wildly entertaining getting to know (and meet!) you guys. The fact there seems to be a tight little group of viewers who dig the ricochet nature of this site has been very, very heart-warming. Many, many thanks. Keep those comments coming and let's do another round, eh? I confess to not having followed your work before I met you, but after I had the pleasure, and in spite of getting whacked in the groodie by you during half rubber, I've not once missed a post. Simply put, you are a remarkable artist, and count myself amongst your legions of fans, and it's also good to know that you're a seriously nice guy. Definitely ready for another round. That John is no relation to our infamous artist thank goodness who does his own taxes correctly and is always ready with a quip or if speechless with a "Say What" text bubble over his head. Looking forward to years of fine art, illustration and successes on your part. hey, I'm just here for the excellent art. John, Thanks for a great year! Please keep it going. Hey, don't forget the RSS lurkers! :) Seriously, thanks for sharing your art, even (especially?) the sketchbook stuff... we love it! I am most definitely a fan of yours. I'll have you know that the new label is a smashing hit. My how time flies. It's a great experiment you've got here, John. The levity and creativity and beauty (and talent) are always fun for me, even when I don't have time to participate. To you, John, for providing the forum for us to riff a little bit without having to expend the time & effort to build our own sites from scratch. It was several months after C&F "discontinued" before I followed the link here, but I'm glad I did. 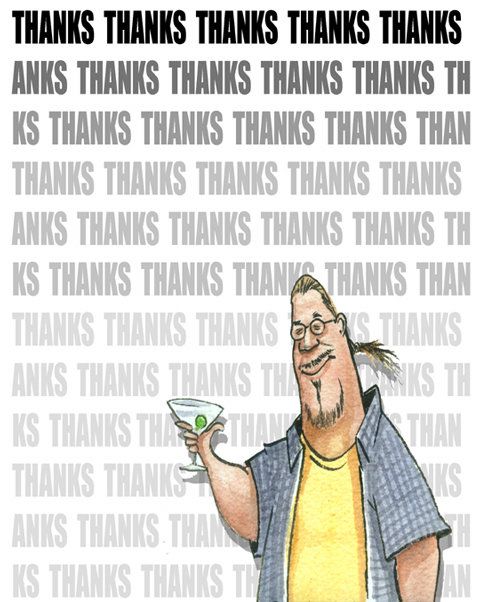 I really enjoy your work...& while I'm a teetotaller, here's to the next 500...& beyond!!! You have been an inspiration for me on many occasions... And I've written a coupla poem-thingies, too! So here's to Year Two, and Thank You for all the great Art! Congratulations from Jerusalem, John. May the fun and excitement continue, only more and better. Congratulations on your first blogiversary. I had my sixth on May 7. SIx? Nice. Though Allen and I have be around since 2003, it feels very different on my own. Good to hear from you guys and thanks again for the creativity you bring to this site. Each morning, there's two sites that I must view - you're Number One, followed by Day by Day by Chris Muir. After that, I try to decide if I'm still alive and have anything suitably stupid to post. I have been looking at your work on the Cox and Forkum site for the past 3 years or so. I was sorry to see it come to an end. Anyways, good luck with the blogging and a big howdy from Tarlac City, Philippines. Congrats on the year, it was good meeting up in Helen, however briefly. Uh.....I thinks ya gots it back'ards. This page contains a single entry from the blog posted on June 3, 2008 4:54 PM. The next post in this blog is TERPSICHORE.